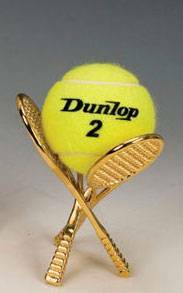 Perfect for the ballplayer in your family, this brass finish ball holder will highlight that all important tennis ball. Holder measures 3 3/4" wide x 4 1/4" high. For added protection, consider putting your display under a 4" x 7" Glass Dome. Sold in a set of 2 each.